Southern California has a new threat to Sycamore, Avocado, Coast Live Oak, Box Elder and Castor Bean that causes severe damage and eventually tree death. The Euwallacea fornicatus, suggested common name is Polyphagous Shot Hole Borer (PSHB), an Ambrosia Beetle, is rapidly killing mature trees throughout Southern California and there’s no way to stop them other than prevention. Once a tree has been infected, the chance of saving it is extremely small. This beetle has probably come to the area from South East Asia, and possibly Africa. It is causing extensive damage to avocado trees in Israel. Trees that already host some form of fungus are ideal for beetle reproduction. The mild damage is branch dieback, but can quickly transition to death. They normally only spend a small amount of time on the outside of the tree before boring in and causing the real damage. We’ve been called out by numerous clients throughout Southern California because we are licensed pest control specialists with the equipment that can reach up to 50 feet high. We are one of the only companies with this capabilities in Ventura, Santa Barbara and Los Angeles counties. Through our prevention measures on your trees, we can stop the invasion north from Los Angeles County. Please call us if you have any of the following trees so we can treat them BEFORE they are attacked. This threat is SUBSTANTIAL and if you have these trees, you must act promptly or risk losing them. Click here for a guide to symptoms in various tree species. 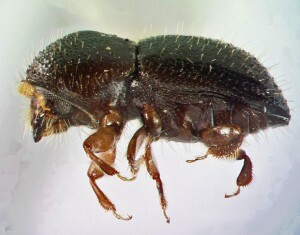 This entry was posted in Landscape problems, News & Updates and tagged Ambrosia Beetle, ash tree, avocado tree, beetle, japanese maple, pest control, shot hole borer, trees. Bookmark the permalink.